Grilling salmon on your George Foreman Grill is very easy and can be done with a minimum of ingredients. 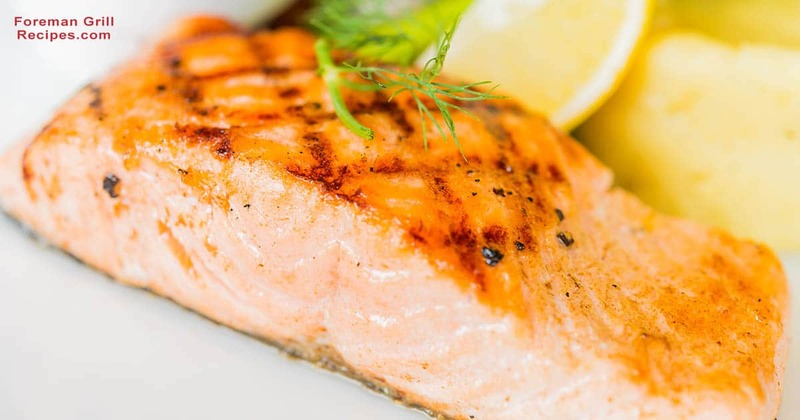 A basic salmon filet should be approximately 4 oz and 3/4″ thick. Of course, sizes of filets sizes may vary depending on what is available from your local grocer, but for best results on the Foreman Grill, 3/4″ to 1″ thickness will be your best bet. Salmon is a flaky fish that is very healthy with a light flavor which can be accentuated any number of ways. Experimenting with different olive oils and your favorite seasonings can create a variety of exciting flavors. The basics for for easy grilled salmon are olive oil, salt to taste and lemon. Adding some smoked paprika can create a beautifully rich yet subtle flavor as well. If you like your salmon smoked, take a look at this awesome Masterbuilt smoked salmon recipe. Overall, have fun making salmon on your Foreman Grill. It’s low-fat, can be low-sodium if desired, and is of course, delicious. A light brushing of olive oil on the grill might be a good idea. Though the Foreman Grill is non-stick, fish can become very sticky so the oil will make cooking and cleanup much easier. Preheat your grill for at least 5 minutes with the lid closed. If you have temperature settings, medium/high will be the optimal setting. Brush both sides of salmon filets with olive oil and squeeze some fresh lemon on just before cooking. Sprinkle with salt if desired and add some paprika. Place on grill and close lid. As a general rule, the salmon can be done in as quickly as 5 minutes. No real worries about undercooking the salmon. Overcooking can make it tough so best to check after 5 minutes. The salmon will be done when it easily flakes with a fork. Great recipe! Had it with grilled asparagus and was so good. I’ve grilled salmon before, but will be trying it this way instead. Thank you. I cook the salmon this way: salt, pepper, paprika then coat with olive oil. place chopped fresh ROSEMARY leaves all over. meat side down 2 1/2 min. brush olive oil sprinkle rosemary then flip 21/2 min more . Will be having this for dinner with home made cole slaw and oven fries. For newer Foremans with temperatures specified by degrees, what is the ideal temp? I had the same question. Have you tried it yet? What temperature did you use? For a George Forman Grill, what is med/high heat? What if the fillets are frozen? I’m not a professional cook but most salmon products highly recommend you thaw it out in your fridge first before cooking. My recommendation is if you know you’re wanting salmon tomorrow, put the frozen in the fridge to thaw overnight. I start mine frozen all the time with no problems. 10 min will do it! Skin side down or up? Did you ever find out if skin side or meat side down?? ?